The best thing about owning a 3D printer or CNC router may not just be what you can additively or subtractively create with it. With a little imagination you can turn your machine into a 3D scanner, and using capacitive sensors to image items turns out to be an interesting project. [Nelson]’s scanner idea came from fiddling with some capacitive sensors at work, and with a high-resolution capacitance-to-digital sensor chip in hand, he set about building a scan head for his printer. In differential mode, the FDC2212 sensor chip uses an external LC tank circuit with two plain sensor plates set close to each other. The sensor plates form an air-dielectric variable capacitor, and the presence of an object can be detected with high sensitivity. [Nelson]’s custom sensor board and controller ride on a 3D-printed bracket and scan over the target on the printer bed. Initial results were fuzzy, but after compensating for room temperature variations and doing a little filtering on the raw data, the scans were… still pretty fuzzy. But there’s an image there, and it’s something to work with. Need a slightly more approachable project to get your feet wet with capacitive sensors? Maybe you should use your phone’s touchscreen as a 2D-capacitive scanner. If anyone tries to take anything from this coin bank they’re going to have to brave the creepy looks that [Vladimir Putin] gives them. That’s because [Overflo] rigged up the wall hanging to react when you approach it. It’s all in the eyes, which open and turn red based on your proximity to the picture frame. The frame itself is the ugliest thing [Overflo] could find at Ikea. He spray painted it gold and added an image of [Putin] with a zany background. At rest [Vlad] has his eyes closed. 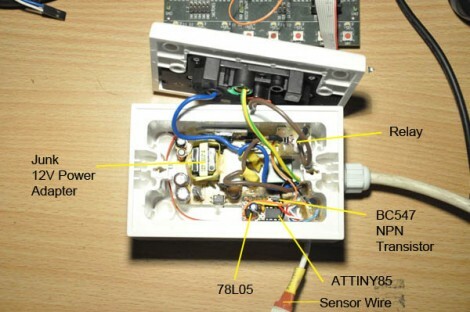 But the lids are connected to a servo motor to pull against the spring that keeps them shut. An infrared proximity sensor is used to trigger the eyelids when you get relatively close, but if you reach out your hand it will even light up the red LEDs hidden in the pupils of the eyes. See a demonstration of the setup in the video after the break. The HOPE conference was last weekend and [Nathan] spent some time with fellow members of Makers Local 256 developing this badge proximity sensor. They took one of the HOPE badges, which have a radio on board for the tracking network, and wrote code for its MSP430 to detect other badges nearby. 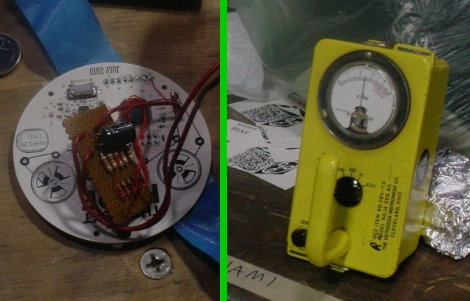 It uses a Geiger counter they brought with them as an enclosure, re-purposing the analog gauge to reflect the level of active radio signals in the area. You’ll find their demo clip embedded after the break. If you managed to get your hands on one of these badges, don’t be shy about sharing your hacks. We want to see them.